Abstract: Based on the i845PE chipset, the IT7 MAX2 Rev2 supports any Pentium4 processors based on the 400/533 MHz FSB. 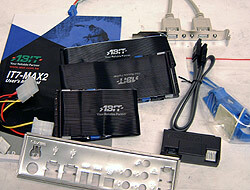 Abit stunned the world in March of 2002 when it announced the "To the MAX" line of motherboards. Manufacturers have been talking about getting rid of the legacy ports on motherboards for a long time but it was Abit which took the initiative and actually did, well just that. 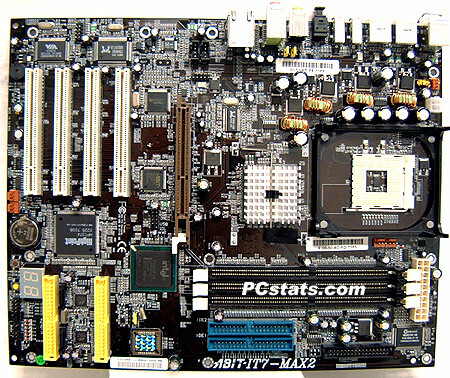 Their original AT7 MAX (KT333) and IT7 MAX (i845E) were quite revolutionary boards. Gone were the Serial, Parallel and PS/2 ports, instead replaced by small army of high speed USB 2.0 and IEEE 1394 jacks. It seems that Abit may have been moving a bit too fast for most consumers though as many in the hardware community complained about the removal of the legacy PS/2 ports. Abit has always been a company to listen to the end user and they did indeed rehash the MAX-series to create the AT7 MAX2 (KT400) and IT7 MAX2 (i845E) with PS/2 ports (but still without serial and parallel). Here's the big list of onboard features include; two serial ATA headers, Ultra/133 IDE RAID, 5.1 audio (including center, sub and optical out), 10/100 LAN, no less then ten USB 2.0 ports (6 onboard, 4 USB 2.0 headers) and finally three IEEE 1394 ports (two onboard, one header). If that's not good enough for you Abit was still able to include four 32 bit PCI slots as well as one 4x AGP port (1.5V lock). Based on the i845PE chipset, the IT7 MAX2 Rev2 supports any Pentium4 processors based on the 400/533 MHz FSB, but Abit recently showed that this motherboard can run at up to 880 MHz FSB (220 MHz Bus Speed) with the right hardware! This means the IT7 MAX2 Rev2 should be able to run the 800 MHz based Pentium 4's that are soon to be released. The three DIMM slots support up to a maximum of 2GB of PC1600/2100/2700 DDR RAM. Ain't she beautiful? It also makes me wonder why my personal version of this board came in a tan brown in colour. It looks like I bought one of the "early" IT7 MAX2 Rev2's before they switched to a black PCB because the local retailers here all stock the black IT7 MAX2 Rev2 now. It's pretty evident that Abit thought of the end user when you consider the layout of the motherboard. The ATX power connector is in an awesome location just above the DIMM slots. With the main IDE and floppy drive connectors to the right of the DIMM's cables will not interfere with case airflow. Pg 3. Is the IT7 MAX2 Rev2 Fast? Pg 8. What is the final word on the IT7 MAX2 Rev2?